I decided to create another card for A Blog Named Hero's "One Layer" challenge. The woman I send cards to for Send a Smile 4 Kids is desperate for boy cards, so I figured this one would work for that! I decided to create a galaxy background, so I used 140 lb. watercolor paper. 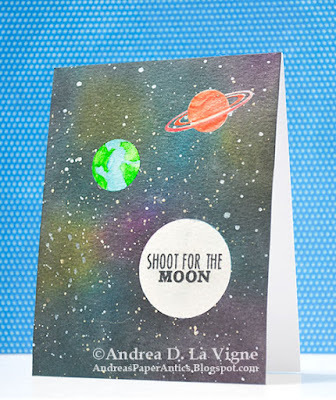 I used Hero Arts' "Shoot for the Moon" stamp set. I began by die cutting 2 circles from masking paper using the "Standard Circles LG" & "Standard Circles SM" die sets from Spellbinders. After I determined where everything would go, I stamped Saturn with Colorbox Putty archival dye ink. I colored it with my Inktense pencils, using a damp paintbrush to pick up the color & apply it to the paper. I then stamped it again with Versamark ink, & clear heat embossed it to seal in the color. To create the moon & Earth, I placed the negative of my circle masks on my card panel. I used an ink dauber to blend a light coat of Scattered Straw Distress ink onto the larger opening (for the moon), and then made "craters" with Stormy Sky Distress ink. I used another dauber to ink over the whole thing with Lawn Fawn Yeti pigment ink. The yellow & blue areas show through, but it's still subtle. Finally, I stamped my greeting with Versafine Onyx Black ink. For Earth, I blended Broken China Distress ink through my mask, then colored a rough estimation of continents with a green Tombow marker. For the background, I first masked off my moon & Earth with the masks I'd die cut. I inked over the whole background with Distress inks in Picked Raspberry, Mustard Seed, & Mermaid Lagoon. When it looked like a hot mess, I knew it was time to add the black! :) I inked over the whole panel with Black Soot Distress ink. This is always kind of scary, because the risk of ruining your whole panel is there. But I think this actually came out to be the best I've ever done! After I'd finished inking, I spattered 2 colors of Gansai Tambi Starry Colors over the panel for stars. I removed the masks, and replaced the negative masking pieces. I inked Earth & the moon with Versamark, and clear heat embossed them, so they would match Saturn. Finally, I removed my masks & adhered my panel to a white A2 card base. I'm also entering this card in 613 Avenue Create's Challenge #201: "Anything Goes." The woman I send cards to for Send a Smile 4 Kids has mentioned a couple of times recently that she needs boy cards desperately. So I have been working to make some for my next shipment. This is one that was inspired by the "One Layer" challenge at A Blog Named Hero. I remembered a lesson in the "Stenciled" class from Online Card Classes that I took ages ago. Jennifer McGuire demonstrated turning the "V-Pattern Mask" from Studio Calico (discontinued) into a diamond design. 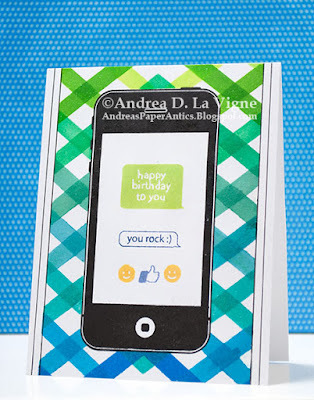 So I decided to combine that technique with the "LOL" stamp set from Hero Arts to create this one-layer birthday card. I first stamped the phone from "LOL" in Versafine Onyx Black ink in the center of an A2-size panel of white cardstock. 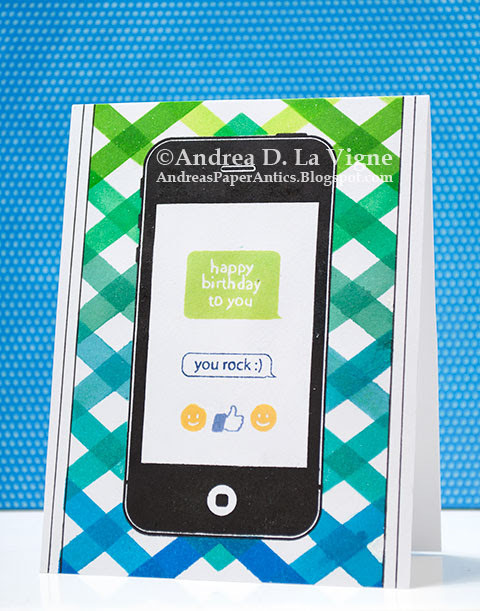 I also went ahead & stamped the greetings in Hero Arts Lime Green & Navy inks. I stamped the little hand icon with Hero Arts Stone Wash ink, & the 2 smiley face emojis with Simon Says Stamp Sunshine ink. The green & yellow inks kind of mooshed on the paper when they dried, so I ended up going over the letters in the greeting and the eyes & mouths on the smiley faces with a white gel pen. Finally, I masked off that area. For my background, I used Twisted Citron, Mowed Lawn, Lucky Clover, Evergreen Bough, Broken China, Peacock Feathers, Mermaid Lagoon, & Blueprint Sketch Distress inks. I taped my stencil over my panel, and masked off on either side of one of the chevrons. I inked that, moved my masks, inked with the next color, & so on. The Blueprint Sketch ended up being too warm a blue, though, so I inked over that also with Mermaid Lagoon. Finally, I flipped the stencil around & went back the other way with the same colors. I removed my mask, & drew 2 black lines along either side of the inked diamond pattern. All that was left then was to adhere my panel to a white A2 card base. This is my 3rd entry for My Favorite Things' "2017 Card Design Superstar" challenge. I'm entering this in the "Innovation Master" category. I created the box from 140 lb. watercolor paper, following the instructions in this post, and the measurements from a different post. After cutting & scoring the paper, I sprayed it with Dylusions London Blue & Vibrant Turquoise; Luminarte Radiant Rain Shimmering Mist; & Heidi Swapp Teal Color Shine mist. Since I was using snowflakes, I just wanted a variety of blues to go with the "cold" theme. I dried that with my heat tool, and repeated the process with the insert pieces. Once everything was dry, I used Dylusions White Linen mist to flick speckles on both sides of the main box piece, to mimic snowflakes. After I assembled the box, I glued in the insert pieces. Then it was time to work on the decorations. I stamped the 3 smaller snowflakes from My Favorite Things' "Sophisticated Snowflake" set (apparently discontinued) in Versamark onto Essentials by Ellen 40 lb. vellum. I heat embossed with Recollections Snow embossing powder, and fussy cut them out. I used a tiny piece of Scor Tape to attach a 1/4" wide strip of acetate to the back of each snowflake, hiding the adhesive behind the embossing. I applied more Scor Tape to the bottom of each acetate strip, and adhered my snowflakes to the inserts in the box. I also adhered a few to the back of the front panel of the box itself. They were a bit too floppy, so I used tweezers to add another tiny piece of tape further up the strip, and adhered each strip in those spots to the insert/box panel. For the side panels, I cut pieces of white cardstock so there would be a 1/8" border all around when I adhered them to the box flaps. 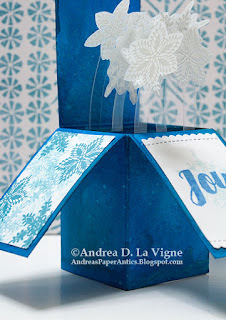 I stamped them with the same snowflakes, using Hero Arts Soft Pool and Memento Teal Zeal inks. I used both first & second generation stamping with the Teal Zeal. 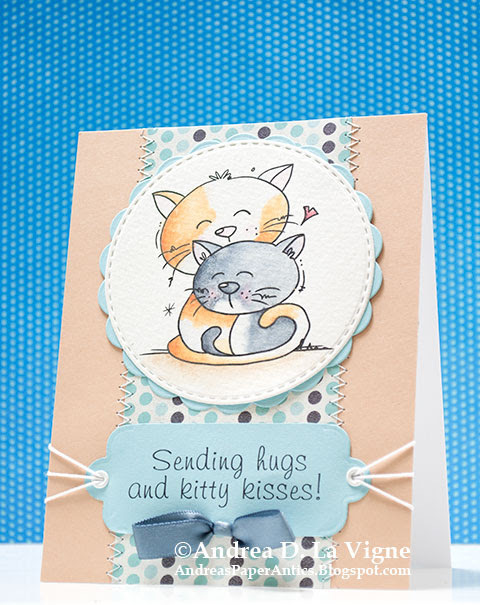 I used one of the "Stitched Scallop Basic Edges" dies from My Favorite Things to die cut the top & bottom of my greeting panel. I stamped the "Joy" from "Joyous Christmas Sentiments" (also from MFT, but discontinued) in Memento Danube Blue ink in the center of the panel. I then used Hero Arts Pastel Blue ink to stamp a snowflake over the greeting, to add some interest but still not compete with the greeting. Finally, I adhered that & my 2 side stamped panels to the box flaps. I really like how this came out overall. My only regret is that I didn't stagger the heights of the snowflakes more. But hey--live & learn, right? I hope whoever gets this card will get a kick out of it! I recently found out through a Facebook group I'm in that a lineman was killed in Victoria, TX, while working to restore power to the residents there after Hurricane Harvey went through. The group member who posted included his grandmother's name & address, so I made this sympathy card to send to her. I began by cutting a panel of Strathmore Smooth Bristol paper to 4.25x5.5". I marked the vertical center of the panel, and adhered a mask that I'd die cut from a full-sticky Post It note using one of the "Flutter of Butterflies - Solid" dies from My Favorite Things. I also cut a piece of copy paper to the same size as my panel, and tore an oval shape from the area that corresponded with where the butterfly was on my panel. I used repositionable adhesive to stick that mask to my panel, and stamped through the opening with My Favorite Things' "Romantic Script Background" stamp, inked with Pumice Stone Distress ink. Before removing either mask, I also lightly inked inside the oval with Pumice Stone. For the greeting, I pulled one from My Favorite Things' "Get Well Wishes" (discountinued). I stamped that with Hero Arts Wet Cement ink, centered on my panel below the butterfly area. To give the panel a more finished look, I marked on the back 1/8" from each side at the corners. Then I used my scoring board & a stylus to score a frame 1/8" in, just to those marks at the corners. I also felt there was a bit of a disconnect between the image area & the greeting. So I colored various size dots with a Tombow marker, and covered each with Morning Dew Nuvo Crystal Drops. That gave the perfect finishing touch! 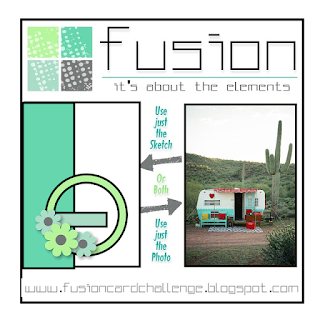 Simon Says Stamp's Wednesday Challenge: "Clean and Simple"
My Favorite Things is having their third annual "Card Design Superstar" challenge. I created this card for their "Coloring Virtuoso" category. For the sky, I used the "Mini Cloud Edges" stencil and Stormy Sky Distress ink. I started towards the top of my panel with the inking, then gradually moved down, using different portions of the stencil so all my clouds didn't look identical. I did leave a bit of a gap in the inking towards the left side. I used painter's tape to mask off a section there, & inked a sun ray with Squeezed Lemonade & Mustard Seed Distress inks. I moved my tape, inked the next ray, and repeated one more time. I made sure the rays got down to the girl's umbrella. I ink blended Shabby Shutters & Peeled Paint Distress inks for the foreground and middle ground. I decided to put a hedge of sorts behind the girl, so I made that a bit darker. I made quick strokes for grass blades with a green Inktense pencil, then went over them with a damp paintbrush, just to "set" the color. (Inktense pencils become permanent after water has been applied & dried.) I also added variation into the hedge with a couple other green Inktense pencils, using a water brush to pick up the color & apply it in a mottled fashion to my inked area, just to add some texture. Finally, it was time to remove my mask & color the little girl. I used my Inktense pencils for that as well, picking up the color from the pencils with a damp paintbrush & applying it to the paper. (This is my preferred method for these pencils, since it gives me more control & I get get softer colors.) For her face, I wet the paper first with clean water, then dropped the color in, to get a smoother blend. On the white bands of the umbrella, I actually went in with a light, gradated wash of yellow, to make it look like the sun rays are shining through the material. After I had finished coloring her, I let the paper dry completely & added more grass blades in front of her boots. I set that color with a damp paintbrush to finish. After letting the panel dry for several hours, I stamped a greeting from "Sunny Thoughts" in Versamark ink over the hedge portion. I heat embossed that with Recollections Snow embossing powder. I let that cool, then adhered my card front to a white A2 card base. The brother-in-law of a friend of my mom's was recently killed in a motorcycle accident. Mama asked me to make a sympathy card to send to her friend. I began with my focal area and worked out. I die cut a doily from ivory cardstock using the larger of My Favorite Things' "Decorative Doily Duo" (discontinued). I also cut several flower pieces from blue & yellow cardstock using 2 of the Spellbinders "Blooms One" dies. I glued the flowers together--3 layers per bloom--applying liquid glue just to the centers. For the background, I cut a piece of patterned paper from Graphic 45's "Trousseau" 6x6" pad for the left side, and adhered it to an A2-size panel of navy cardstock. I stamped a greeting from Avery Elle's "With Sympathy" set onto a strip of tan cardstock with Versafine Onyx Black ink, and cut the right end at an angle. After adhering the doily to the card front, I glued down my greeting strip & flowers, tucking the left end of the strip under the larger flower. Finally, I mounted the card front to a white A2 card base. 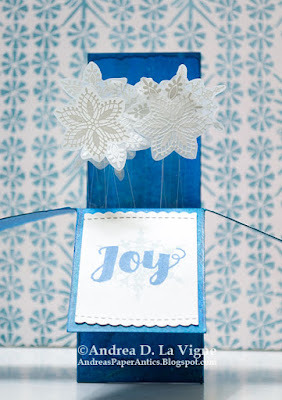 Dies R Us #80: "Die Cut Handmade Flowers"
The theme for Merry Monday Christmas Challenge this week has been "Joy." 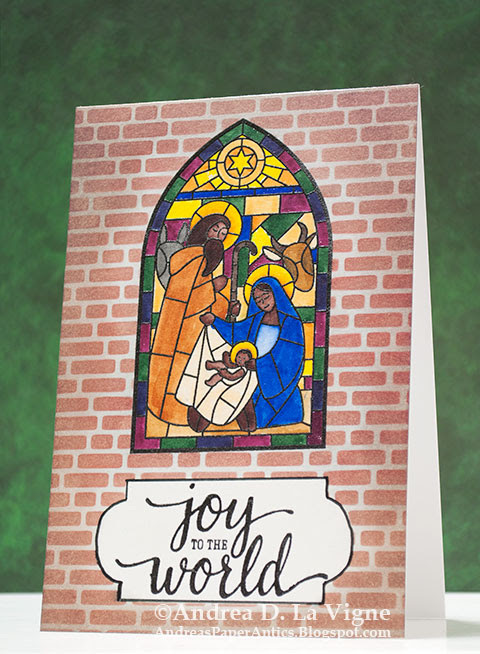 I created this one-layer card using Hero Arts "Stain Glass Nativity" (discontinued) & "Joy to the World" stamps. Because of the size of the stamps & the layout I wanted to use, I ended up having to make a card slightly smaller than A6 size. I first cut a piece of Strathmore Smooth Bristol paper to 4.25x6.25". After I stamped & heat embossed the image & greeting, I masked them off. I created the mask for the greeting by die cutting one of the "Labels" from Sizzix/Tim Holtz from a full-sticky Post It note, and trimming the top & bottom to be straight. Once the masks were in place, I inked the whole panel with Hickory Smoke Distress ink. I wanted to create a brick wall look, so this was my "mortar." I taped the "English Brick Wall" stencil from My Favorite Things over my panel. I inked that with Fired Brick & Pumice Stone Distress inks. I had to move the stencil up, matching up the pattern, because it wasn't large enough to cover my whole card front. Thankfully, it's an easy pattern to match! After I removed the stencil, I inked around the edges with more Pumice Stone, to accent the center. I colored the image with my Zig Clean Color Real Brush markers, adding in a few Tombow markers for colors I didn't have in the Zigs. Once that was done, I lightly (and carefully!) buffed off the ink that was on top of the embossed lines. I outlined the greeting area with a black marker, and adhered my card front to a white card base. A Blog Named Hero: "One Layer"
Simon Says Stamp's Monday Challenge: "Stamp It"
Creative Knockouts #210 : "Something to Say"
The Houston (TX) Humane Society personnel have been working to help rescue animals from the flooding there as a result of Hurricane Harvey. Even though we did send a financial donation to help support their mission, I thought I would send an encouragement card to their employees and/or volunteers as well. For the design, I used the current challenge sketch for Stella Says Sketch. I went through my critter (digital) images from Bugaboo, and came across the "Kitties" image. I felt this would be perfect for my card. I sized the image in Photoshop, and printed it onto a piece of 140 lb. watercolor paper. I die cut that with a Simon Says Stamp "Stitched Circles" die. I colored the kitties with my Inktense pencils, using my preferred method of picking up the color from the pencil with a damp paintbrush, and applying it to the paper. I also added just a bit of shading under the image to ground it. I cut a piece of patterned paper from The Paper Studio's "Best Day Ever" mat stack to go in the center of my card. I also cut 2 strips from a peachy-beige cardstock to go on either side. I adhered the strips to a 4.25x5.5" panel of white cardstock, and adhered my patterned paper in the center. I then machine-stitched a zigzag stitch along each long edge of the patterned paper. 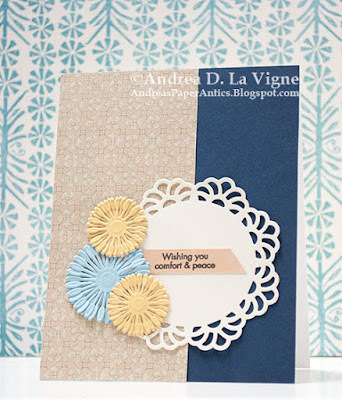 To mat the focal image, I die cut a scalloped circle using a We R Memory Keepers "Nesting Scallops" die. I adhered my image circle to that, and glued it to my card front. For the greeting, I cut a strip of pool colored cardstock. I created the greeting in Photoshop, using a "canvas" the same size as my strip. Then I printed it onto my cardstock. I die cut each end with the smallest of the "Tag Toppers Crescent" dies from Sunny Studio to make a label shape. I adhered that to my card front, punched a hole in either end with my Crop-a-Dile II, then used the same tool to set a white eyelet in each hole. Finally, I threaded 3 pieces of crochet twine through the eyelets, spread out the ends on either side of my panel, and taped them to the back. As a finishing touch, I created a faux bow at the bottom of my greeting label, following the instructions in this YouTube tutorial. I adhered my card front to a white A2 card base, and this card is ready to write & send! 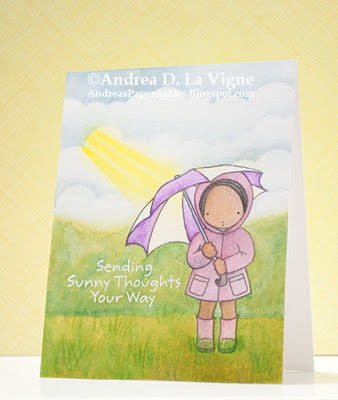 Creative Knockouts #210: "Something to Say"
Sandy Allnock recently posted about sending encouragement cards to the rescue workers in the Houston, TX, area. Since we live only a few hundred miles north of there, I've been seeing a lot from friends about the devastation & horrors; but also about the generosity that has been going on there. I decided to make a few cards to send to the first responders in the area. Sandy suggested making cards aimed at both men & women. This first one of mine definitely falls in the latter category! 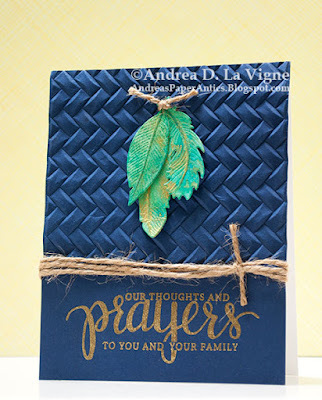 I really decided to play & experiment a little with the flowers & leaves on this card. 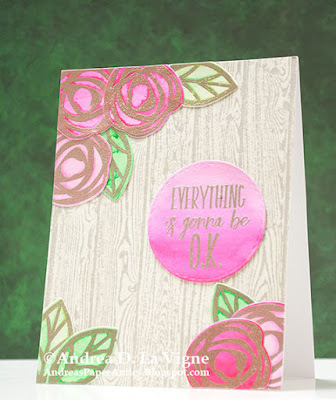 Using the "Bold Blooms" stamps from the Essentials by Ellen line, I first tried "inking" up 2 of the stamps with Tombow markers, misting with water, and stamping onto Strathmore Smooth Bristol paper. While that was nice, I didn't really like the uncolored spaces between the stamp lines. So I tried again, this time misting the paper rather than the stamp. Again, an OK look, but now a bit too mushy. Finally, I just scribbled spots on scraps of bristol paper with the markers, spritzed it generously with water, and dried that with my heat tool. Then I stamped the leaf & flower in Versamark ink, and heat embossed with Ranger Liquid Platinum embossing powder. Finally--I had the definition I wanted, and the all-over color! I created a total of 5 each of the smaller flower & leaf, & cut them out with the coordinating dies. For my panel, I stamped the "Wood Plank Background" from My Favorite Things onto a piece of ivory cardstock, with Hero Arts Wet Cement ink. I wanted some interest in the background, but didn't want it to compete with my main elements. I stamped the greeting, from Essentials by Ellen "Up the Happy" set, in Versamark on another scrap of bristol, and heat embossed it with Liquid Platinum. I die cut it with a Simon Says Stamp "Stitched Circles" die. To create an ombre look, I took one of my pink markers that I had used on the flowers and colored the bottom part of the circle, bringing the color up maybe 1/4 of the way. Then I took my water brush, and spread the color up the rest of the circle, letting it fade out to a pale pink at the top. To complete my card, I adhered the greeting, so it is centered on a "line" about 1/3 of the way from the right side of the card, in accord with the Rule of Thirds. I arranged my flowers & leaves, and glued them to the panel with liquid glue. When that had dried, I trimmed off the overhanging bits with scissors. Finally, I adhered my card front to a white A2 card base.